When Yamaha launched the ground-breaking DT250 in 1968, it totally wrong-footed its rivals – which was probably part of the game plan anyway. The DT250’s designers always knew that it would be only a matter of time before competitors launched their own large trail irons, and knowing just how good the Japanese psyche is at emulating someone else’s design, it was almost a sure-fire bet that Suzuki and Kawasaki would respond in kind with single-cylinder 250cc designs of their own. Honda learned from the mistakes of its first SL350 trail bike and the second version was better. Yet you can’t help but wonder what the guys sitting in Yamaha’s Iwata base thought Honda’s response might be. The Big Aitch had always been target material for the upstart Yamaha organisation, and the tuning fork brand had made an open secret of the fact that it would consistently and gladly take the battle to Honda wherever and whenever – so Yamaha must have been laughing up its corporate sleeve when the covers were taken off Honda’s response to the DT250. In reality, Honda’s 1969 SL350 response was little more than a hastily cobbled-together trail bike born out of a knee-jerk reaction to the DT’s instantaneous success. Although undoubtedly the SL350 would have been launched with a fanfare and flashing lights, many who looked (and fewer who laid their money down) saw pretty quickly through styling razzmatazz, for in effect Honda had taken one of its K-series CB350s, painted the frame silver, added some new guards and a single seat and hoped for the best. Even the exhaust system was compromise, and manifestly unsuited to the rigours of off-road riding. 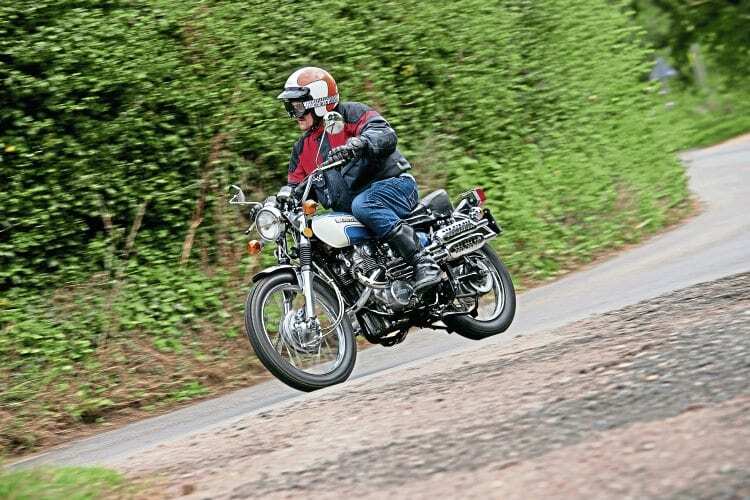 However those who still couldn’t cope with smelly two-strokes but wanted to ride trails grabbed the SL350 with both hands – and then often wished they hadn’t, for the three-fifty twin had a nasty habit of biting back! The SL was no lightweight, either, for pivotal to its apparent bad manners was a kerb weight of almost 170kg against Yamaha’s 110! The next limiting factor was the simple fact that the engine made too much power for an overweight dirt bike with questionable frame geometry. Riders regularly found themselves sitting on their backsides in the dirt looking at a now slightly battered SL350 still running on its side – and the coup de gras for the new four-stroke trail iron was its dangerous habit of cutting out dead after a jump. Previous Post:An accident waiting to happen! Next Post:Bent and battered, but still going strong: every picture tells a story!